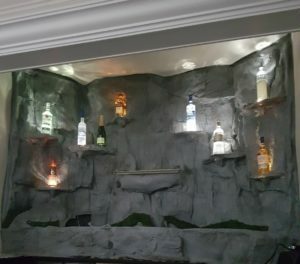 Unique drink bar display stand with LED lights installed and centered on each shelf. 4 rock shelves per side and 8 total. More can be added or customized as per your requirements. 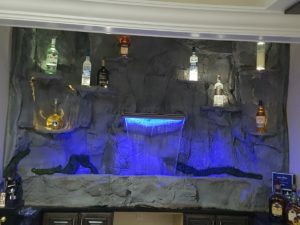 These features are very popular with new homes in Surrey, BC as more people look for unique ways to decorate their basement bar areas when entertaining guests. We custom build each by hand from scratch. Panels are cut, bent, and shaped to create a realistic rock-like texture that is lightweight and easy to customize with various lighting effects. 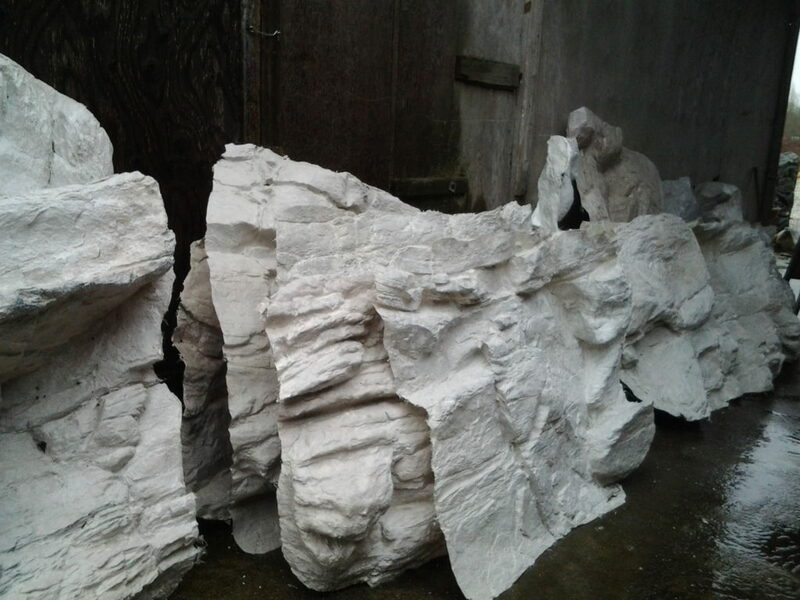 At WaterfallNow, we hand-craft each rock panel according to the clients needs. Once created, we ship the panels to the job-site where the rocks will be installed. 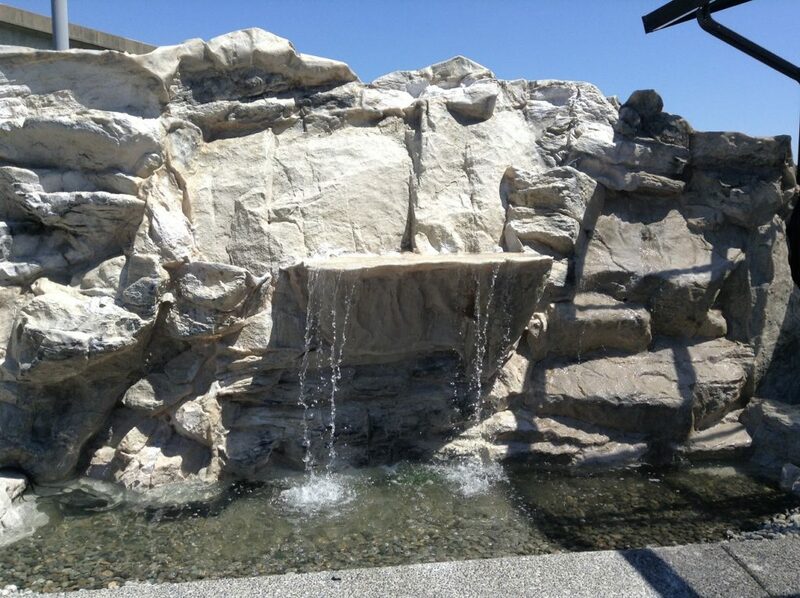 WaterfallNow has 50+ different types of rock panel styles to choose from. We will also custom hand-craft new designs. Our rock panels are durable and light. Each fiberglass panel is light enough for 1 person to carry on their own. These are ideal for largescale projects, easy to ship, and great for indoor applications where other methods are not ideal. These can be connected to a wire frame or through some other internal bracing mechanisms to form the inner shape of the rocks. As you can imagine, there is no real limit to the sizes that we can produce once everything is assembled and put together. 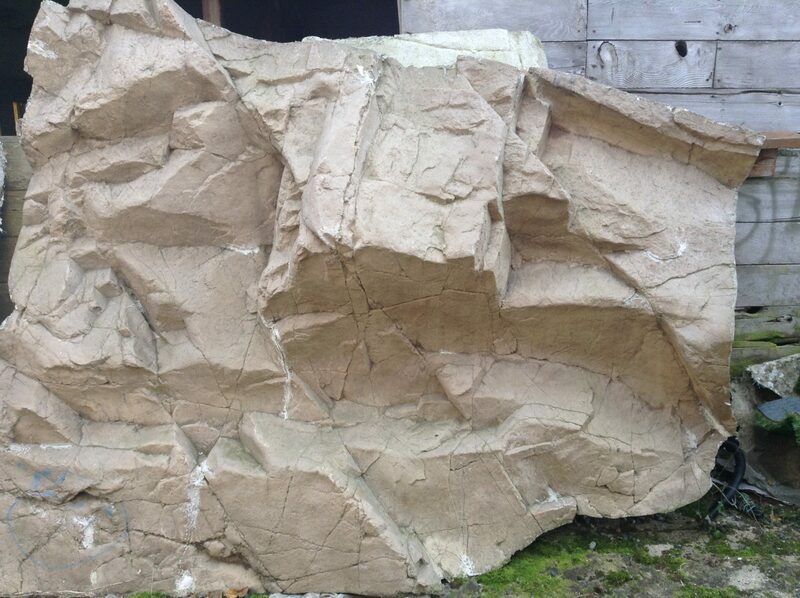 The rock panels thickness can be adjusted based on the clients needs. We often recommend a thicker application for commercial uses. Our rocks can be painted to any color. Don’t like brown? We can paint it grey over top. Want pink rocks? We can do that too. Specific colors can be added according to the clients desires. Our fiberglass rocks can be incorporated onto natural rock cliffsides as well as onto concrete. With the help of landscaping, plants, trees, shrubs, and other garden ornaments, these rocks can blend in with nature looking like actual rock. 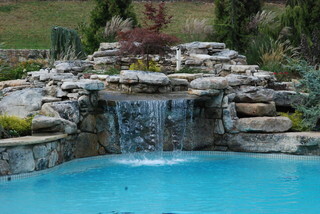 We add LED lighting and plumbing to create custom artificial rock water feature fountains that look and sound great. 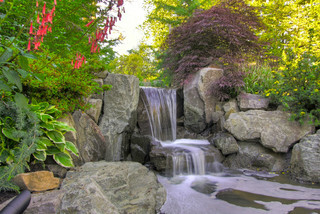 We want more people to enjoy spending time in their yards relaxing by a unique waterfall built just for them. Imagine… You could be spending your evenings relaxing by your own unique waterfall within a few days from today. The sooner you call us, the sooner we can make it happen. 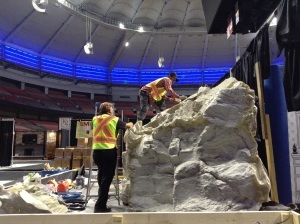 WaterfallNow will show you the gist of how we create imitation or mock rocks. These are the rocks that we use to create our water features. There are different materials we use for different applications to achieve different textures. We also employ different materials to get a different weight, sound of water, and natural color over time through the growth of moss. There are many people searching for ways to make homemade imitation rocks. The do it yourself (DIY) videos online are teaching methods that will crack, chip, and break easily. WaterfallNow has tried virtually every method and can say that the method we employ has been tested thoroughly and is employed by all the biggest companies in the world. Why make small boulders when you can make mountains? 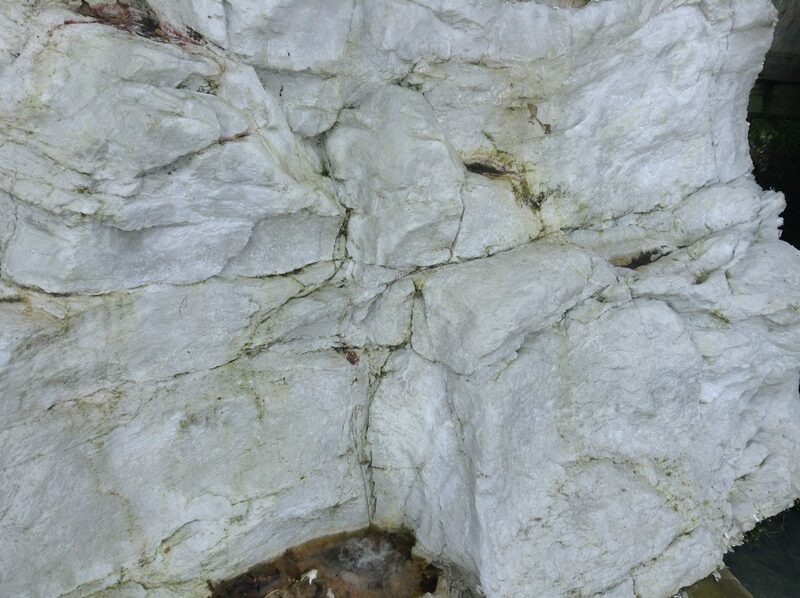 This is what people think of when they hear the words faux rock or imitation rock. Not very appealing. Styrofoam is nice indoors but doesn’t last outdoors. 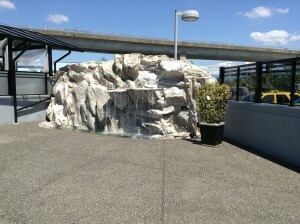 Video on how imitation rock panels are used to make a small fountain. Made using a lighter panel for this application. 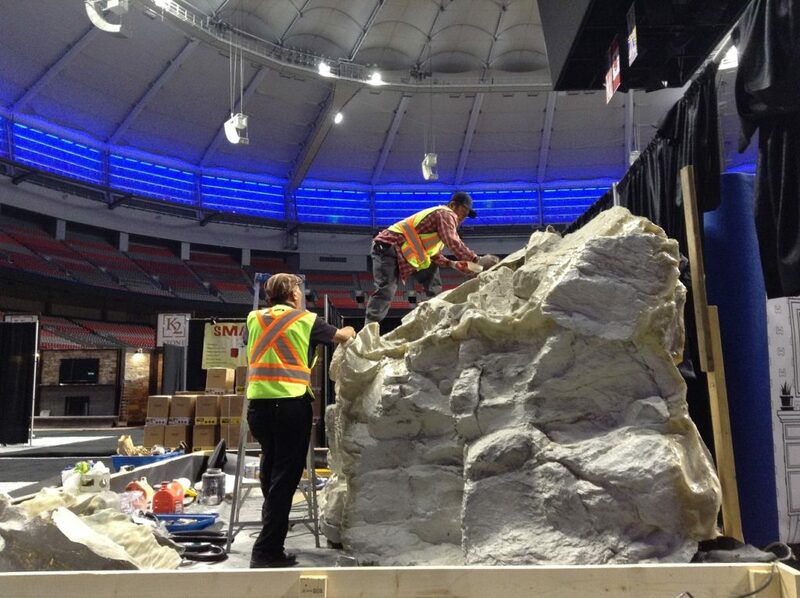 Get a gist of how to make realistic imitation rock panels here using GFRC/fiberglass. These artificial/faux rocks look better than the real thing in some cases. In many cases they can even cost less than the real thing. 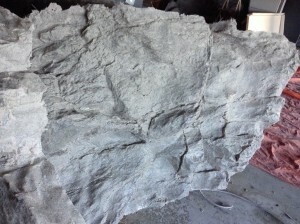 There are many ways to make artificial rock panels. 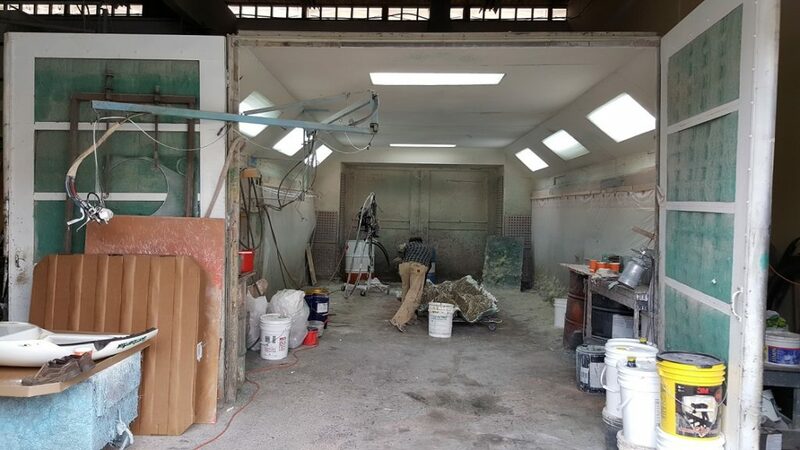 Depending on the project, you can employ either a lightweight rock panel or a much heavier and thicker GFRC panel for large commercial applications. Are you a landscaper or custom pool builder looking to add a unique value proposition to your business? Email info@waterfallnow.com to learn how you can get hands-on training and order panels from us in bulk. Requirements: Your business must have revenues beyond $1 million USD per annum. 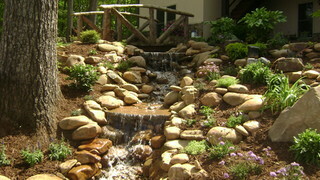 Now is the perfect time to add a water feature and spend more time in the yard. 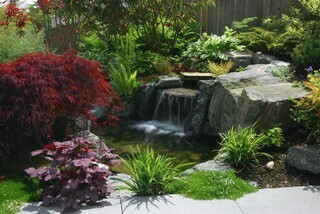 Here are a several resources available on creating your standard DIY water features. As you can see from the above video, it doesn’t take much money or time to create your own patio water features. The sound of trickling water can enhance the ambiance out on the deck. 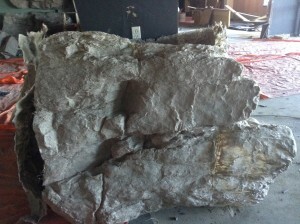 The next 4 part video courtesy of The Pond Digger features a mix of natural and faux rocks that are used to create a basalt column rock bubbler bird bad fountain. Don’t be afraid to add more variety with the types of rocks or plants used and to experiment with new ideas. Another recommendation is to find a spot clear of trees and to avoid placing them in areas where you get lots of falling leaves as that can cause the water to flow out or clog the pump. 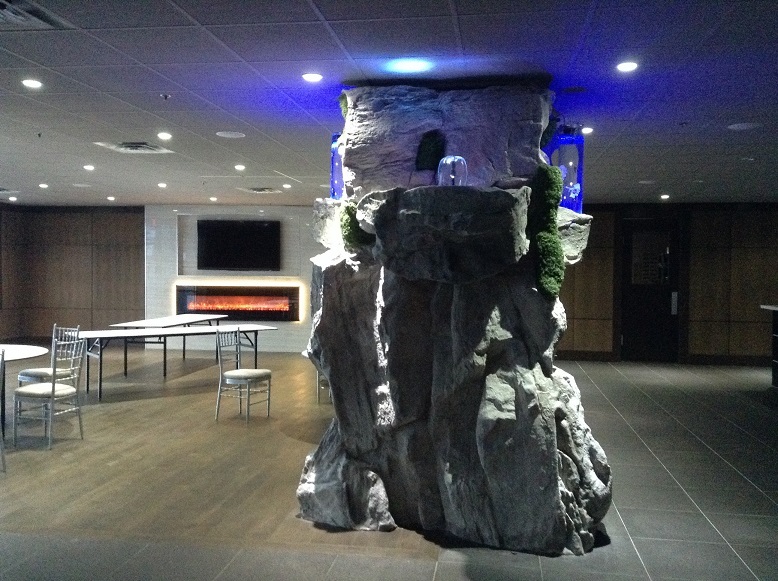 Not sure where to buy a faux basalt rock column? Here is a do it yourself tutorial courtesy of Arteolike. Basalt column fountain installation kits can sometimes be found at your local garden shop. 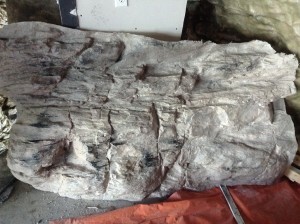 However, this method demonstrates one of the many techniques to creating a faux basalt column. Real basalt rock columns for garden purposes can weigh thousands of pounds and requires heavy machinery to install. That is something better left up to the professionals. 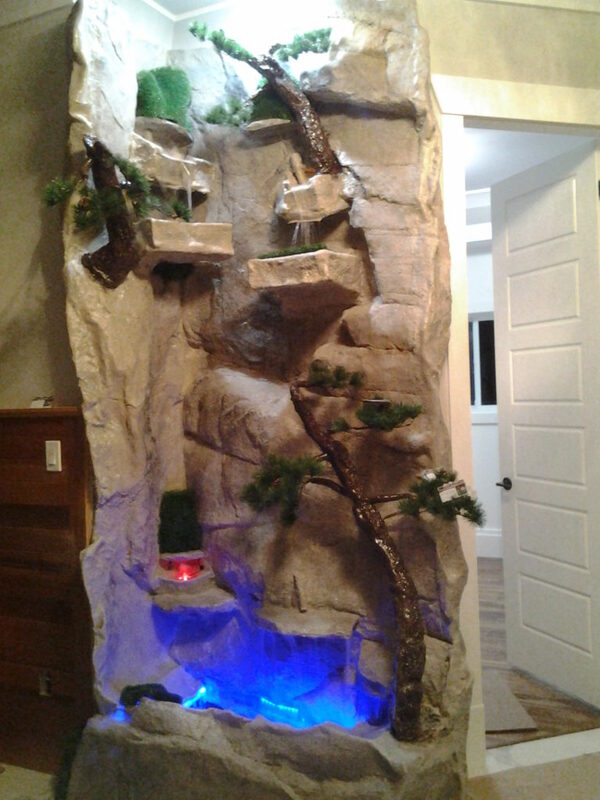 The artificial rock water features such as waterfalls and fountains created by WaterfallNow do not fall under the do-it-yourself category. 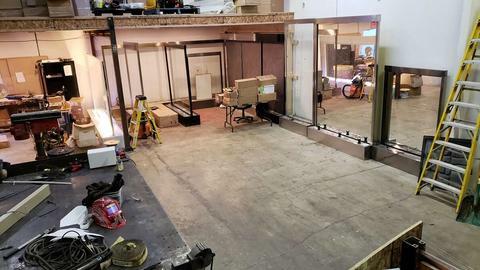 We have spent many years developing our skills and experience creating custom water features while constantly stepping out of our comfort zone. However, there was a time when we once failed miserably at creating small do-it-yourself water features. Fast forward to 100’s of water features later we can say that we are definitely much more experienced than we were many years ago. Whatever your next DIY project, just remember that if you aren’t failing, you aren’t just trying trying hard enough. Get creative. All you really need is a small pump, tubing, drill, screws, glue, and some creativity. 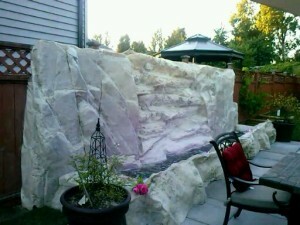 Now you have a few examples of how to create quality do it yourself outdoor water features. Start with the basics and maybe someday we can combine our work on the same project. Hopefully you’ve stumbled across this page because you were looking for some inspiration and found it. Feel free to share your ideas with us on our Facebook page.